Opening address. 1. Aspects of Thermal Field Theories. Contributors: D. Boyanovsky, H. Ezawa, R. Holman, M. Ichiyanagi, H. Matsumoto, K. Nakamura, M. Suzuki, K. Tanabe, Ch. G. van Weert, K. Watanabe, G.R. Welch. 2. Methods of Thermal Field Theories. Contributors: L.-Y. Chen, R. Kobes, F. Mancini, A. Niegawa, J.P. Paz, Z-B.Su, L. Yu. 3. 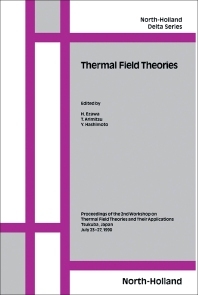 Concepts of Thermal Field Theories. Contributors: T. Arimitsu, E. Celeghini, H. Ezawa, Y. Hashimoto, B.-L. Hu, K. Iwasawa, A. Mann, T. Marumori, K. Nakamura, M. Rasetti, M. Revzen, F. Sakata, H. Umezawa, G. Vitiello. 4. Applications of Thermal Field Theories. 4.1 Nuclear Physics. Contributors: A. Kuriyama, L. Münchow, J. da Providencia, M. Yamamura. 4.2 Quantum Gravity. Contributor: A. Hosoya. 4.3 String Theories. Contributors: M.J. Bowick, E. Copeland, S. Holbraad, S. Yu. Khlebnikov, M. Knecht, Y. Leblanc, H. Okada, R. Rivers, A. Tsuchiya, J.C. Wallet. 4.4 Gauge Fields. Contributors: R.F. Alvarez-Estrada, J. Cleymans, I. Dadic, E. Dagotto, K. Enqvist, Al. R. Kavalov, R.L. Mkrtchyan, H. Nakkagawa, M. Ogilvie, A. Rebhan, I. Zahed. 5. Topics of Thermal Field Theories. Contributors: T. Arimitsu, M. Ban, P. Elmfors, T. Evans, Y. Georgelin, H. Hara, A. Holz, I. Ito, T. Iwasaki, T. Kon, Y. Leblanc, M. Lutz, S. Midorikawa, A. Moreo, M. Nakamura, Y. Nakano, M. Ochiai, K. Ohnishi, R. Ozao, J.P. Paz, T. Saito, B.-S. Skagerstam, Y.H. Tamura, S. Takagi, K. Tanabe, F. Willeboordse, Y. Yamanaka, Y. Yamazaki. Theories of quantum fields at non-zero temperature have been steadily developed for well over a decade. In 1988, as a result of the increased demand for communication among theorists working in different fields ranging from condensed matter physics to high energy physics and astrophysics, the first international meeting was organized (the proceedings of which have been published in Physica A 158, 1989). This 2nd workshop covers similar fields, namely equilibrium and non-equilibrium statistical physics, quantum optics, high-temperature gauge-field theories, string theories, statistical theories of gravitation and cosmology. The resulting proceedings reflect the progress made in the respective fields, identify the major common problems and suggest possible directions for their solutions.